He’s a living legend, so Leon Johnson is a perfect pick to be Saturday night’s Exchange Bank Demon Great of the Game as the Northwestern State football team hosts Southeastern Louisiana at Turpin Stadium. Johnson, 77, who coached track and field at NSU for 31 seasons before his 2013 retirement, will be recognized on the field and the videoboard during a first quarter timeout. Kickoff of the game is 6:30. In May, Johnson was inducted in the Southland Conference Hall of Honor. He was enshrined in the N-Club Hall of Fame at NSU in 1999, 14 years before his ultimate retirement. He’s also in the Louisiana High School Hall of Fame and has been recognized as a Natchitoches Treasure. Johnson has over three decades of service to the institution, the conference and the larger track and field community. Coast to coast, track and field coaches through the years have recognized and respected him for his integrity, coaching skill and perspective. Only H. Lee Prather, basketball coach for 36 seasons until 1950, served longer as a head coach at Northwestern. The Southland Conference Men’s Outdoor Track and Field Coach of the Year Award was named the Leon Johnson Award shortly after his retirement. Johnson joined Northwestern in August 1982. He has eight Southland Conference Track and Field Coach of the Year awards, and two more from the Gulf Star Conference. His competitors won 51 Southland Indoor event championships and 83 Southland Outdoor event titles since the Demons joined the league in 1987. His teams won eight conference indoor and outdoor team championships. Johnson coached 57 All-Americans, nearly 100 NCAA championship qualifiers, numerous national champions and two USA Olympians, triple jumpers LaMark Carter (2000 Sydney Games) and Kenta Bell (2004 Athens Games and 2008 Beijing Games). Johnson coached NSU to top 20 finishes in both the NCAA Division I Indoor and Outdoor Track and Field Championships. The achievements are only part of his legacy, which continues to expand. Johnson has volunteered his time to causes such as Louisiana Special Olympics, the American Heart Association, and the American Cancer Society. He continues assisting those causes, the sport in general, and the NSU athletic department. He is a volunteer assistant and advisor for the Demons’ basketball program, providing conditioning and flexibility insight for the players and sharing his wisdom with the coaching staff. A Demon Great of the Game is spotlighted at each home football game. 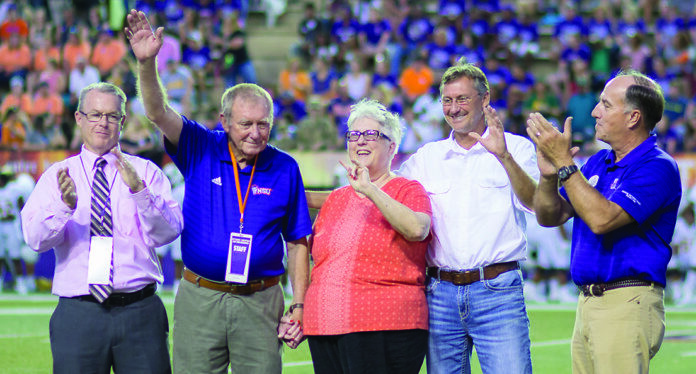 In its first four years, the Demon Great of the Game presented by Exchange Bank and Trust has honored 22 outstanding figures in the 109-year history of NSU athletics. Harris Wilson Jr., known as “Coach Black” to his legion of friends, was the first 2017 Demon Great of the Game, spotlighted at the Sept. 16 win over Lamar. Since 1996, he has worked with all of the NSU sports. Exchange Bank and Trust has been a key supporter of NSU Athletics throughout its long history as the oldest financial institution in Louisiana.